St. Martin's Griffin, 9780312380762, 416pp. Bennie Rosato looks exactly like her identical twin, Alice Connelly, but the darkness in Alice's soul makes them two very different women. Or at least that's what Bennie believes—until she finds herself buried alive at the hands of her twin. Meanwhile, Alice takes over Bennie's life, impersonating her at work and even seducing her boyfriend in order to escape the deadly mess she has made of her own life. But Alice underestimates Bennie and the evil she has unleashed in her twin's psyche. Soon Bennie, in her determination to stay alive long enough to exact revenge, must face the twisted truth that she is more like Alice than she could have ever imagined . . . and by the novel's shocking conclusion, Bennie finds herself engaged in a war she cannot win—with herself. With its blistering speed, vivid characters, and perplexing moral questions, Think Twice is a riveting emotional thriller that will keep readers breathless until the very last page. On the first page, we are told that Bennie and Alice, despite identical DNA, are polar opposites—but are they? Aside from appearance, in what ways are these women "twins"? What traits do they share? 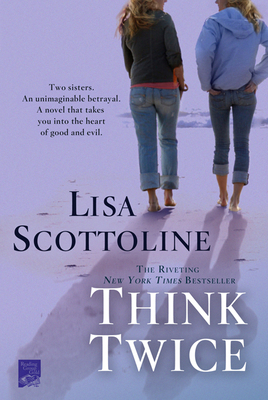 Think Twice asks the question: Is evil born or bred? How does the book explore the question, and how would you answer that question? Do you think there can be evil in a good person, and good in an evil person? Explain. When pushed to the limit, do you think we are all capable of evil? Talk about what might make you do something you would otherwise never do. What is the significance of Alice’s decision to bury Bennie alive? Is it cruel torture, a flash of compassion, or simply an error in judgment? In what ways have they both "buried" each other over the years? Is this act metaphoric of something else? Speaking of her relationship trouble, what did you think about Mary’s decision about the house? Did you agree or disagree? Why? Is Anthony old fashioned to want to be the main breadwinner in their relationship, or is that urge to provide in a man’s nature? How are disparate salaries playing a role in today’s relationships? Is Valentina a real witch or a charlatan? Does she have superpowers or just a good gut instinct? Do you trust your instincts? Have you ever had an experience that led you to believe you might have a sixth sense?